Velour quality is the ultimate luxury in bathrobes with the surface being razed to ensure the fabrication feels extremely soft in feel and very comfortable to wear. We offer an exclusive collection from stock as well as our bespoke service means we can offer you any colour and style in the velour range. Email us today on more information on our bespoke service. Product Information on plain classic ultra soft velour bathrobe: Now we are offering the plain st.. 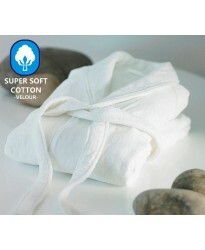 Product Information on ORGANIC ultra soft velour bathrobe: This is a ORGANIC velour bathrobe..